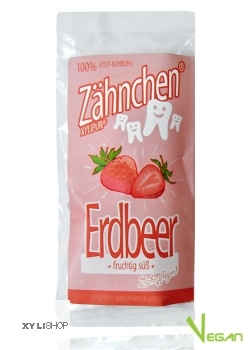 Effect: The maximum possible concentration of xylitol has an optimal tooth-care effect. Application: After each meal and the last brushing, leave the candy slowly in the mouth. Chewing not recommend. Let saliva flow through the rows of teeth. Grundsätzlich ein ebenso gutes Zähnchen wie alle anderen Sorten. Das Aroma finde ich leider nicht so überzeugend wie z.B. Orange oder Vanille.